All books designed and created by me. 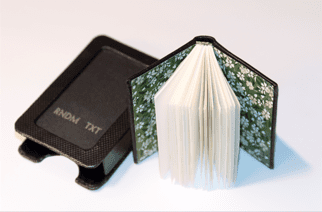 While miniature book editions are the primary output for Aredian Press, I also create one-of-a-kind and larger format books. Please contact me for price and availability. 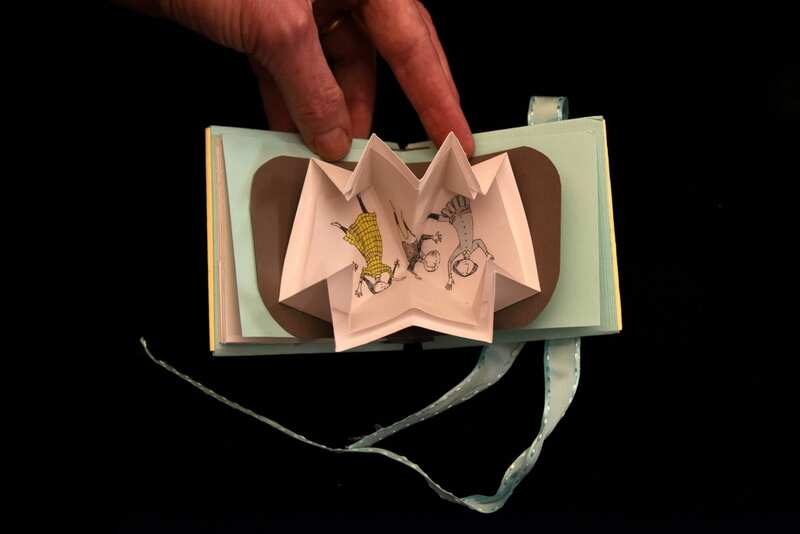 The Chinese Zodiac reproduces at reduced scale printmaker Terri Thoman’s series. 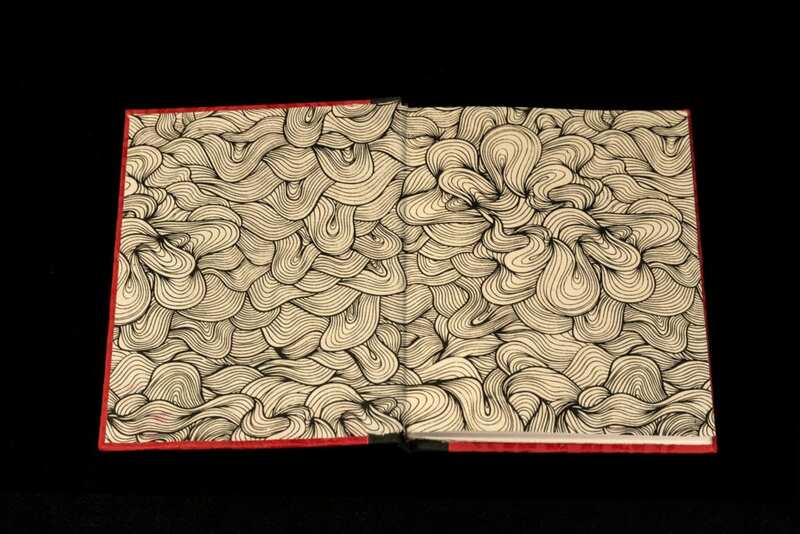 The book and its enclosure designs were inspired by the artist’s east-meets-west approach to the subject matter. 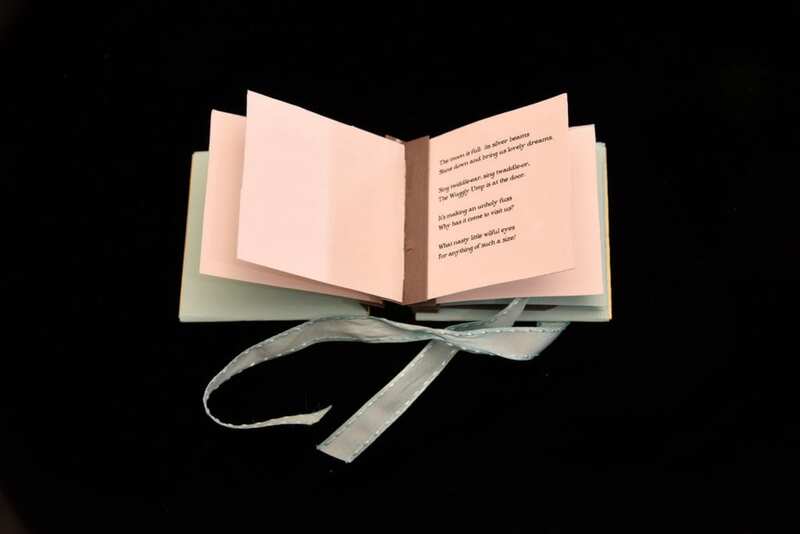 Created as a star binding with exposed stitch spine, the prints are showcased in a gallery format. Together with its accordion-folded text ‘wings’, the overall presentation is meant to subtly evoke a Chinese parade dragon or fireworks. Perhaps your shopping list is not so private. RNDM TXT is an exploration of personal information made public. Letter-pressed by Small Fires Press of New Orleans on Crane Lettra in 6 pt Calibri. 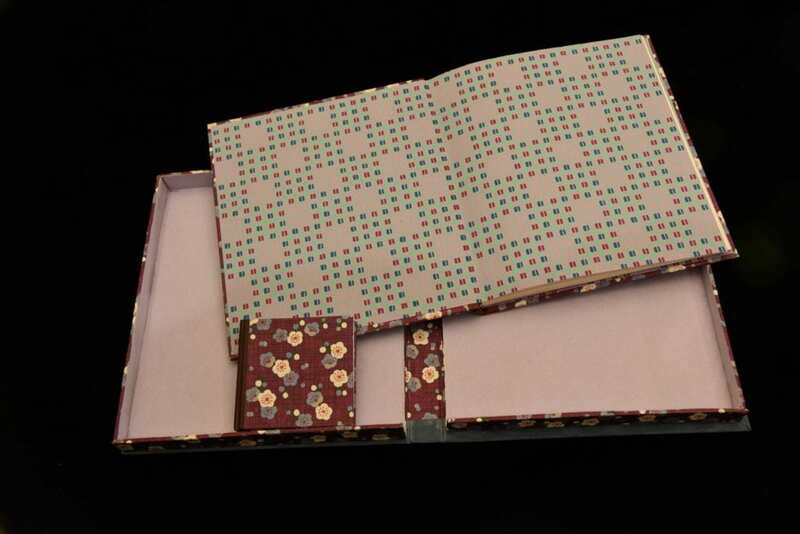 Endsheets of chiyogami with a vintage green and white floral pattern. 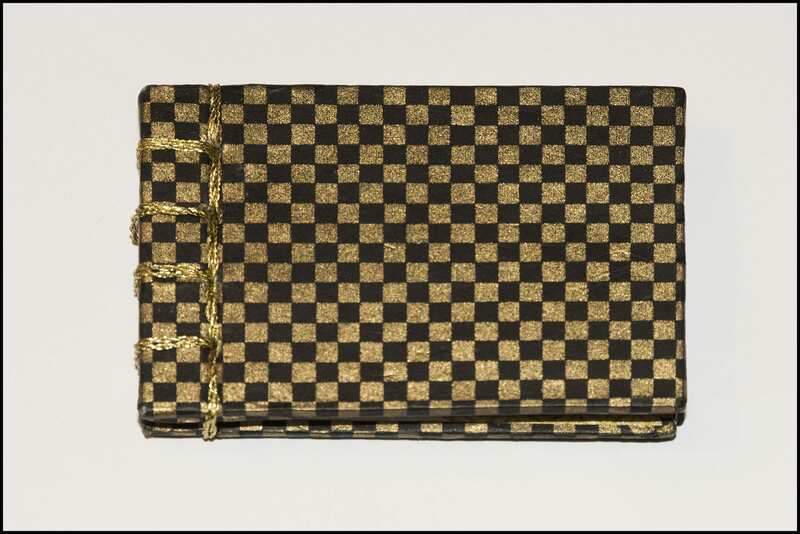 The book is case bound in black alligator- patterned goat skin, much like an old-fashioned pocket address book. 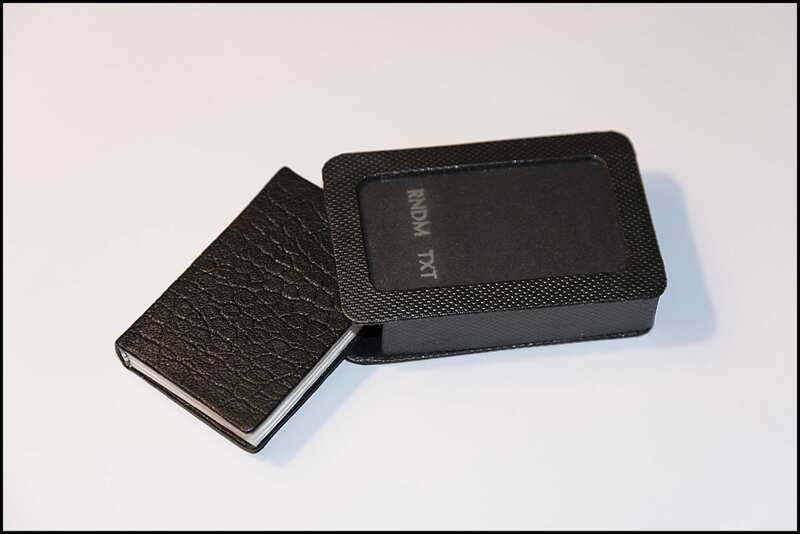 The enclosure is styled as a smart phone encased, with the title foil stamped on a shimmering paper. Dimensions: 2 15/16" x 2" without case. An edition of twenty books is planned. Overwrought by grade-schoolers and wanna-be poets, the haiku has been abused unintentionally for far too long. First attempted to distract themselves during an excruciating flight, the authors acknowledge that the haiku in its purest expression is both lyrical and majestic. These are neither, but offer commentary on modern life. Printed in 9 pt Tempus Sans ITC on mulberry paper. 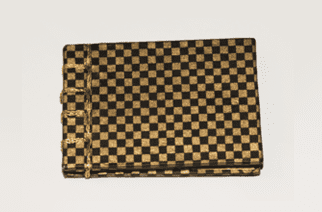 Two black and gold chiyogami papers are cover papers; its traditional stab binding was accomplished with gold metallic thread. Dimensions: 2 1/4" x 3". An edition of twenty is planned. The Marshes of Glynn is a long poem about the Golden Isles off the coast of Georgia. 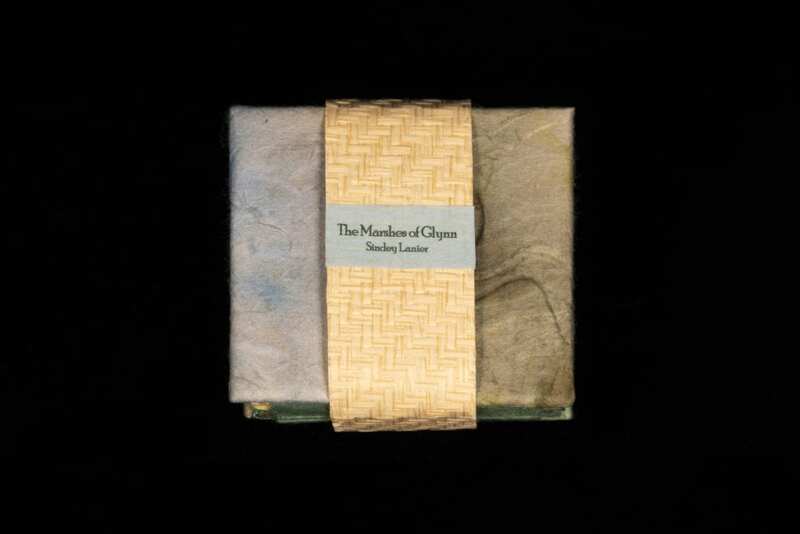 The book contains the poem itself, a short biography of the author, Sidney Lanier, and a US postage stamp issued to honor him. 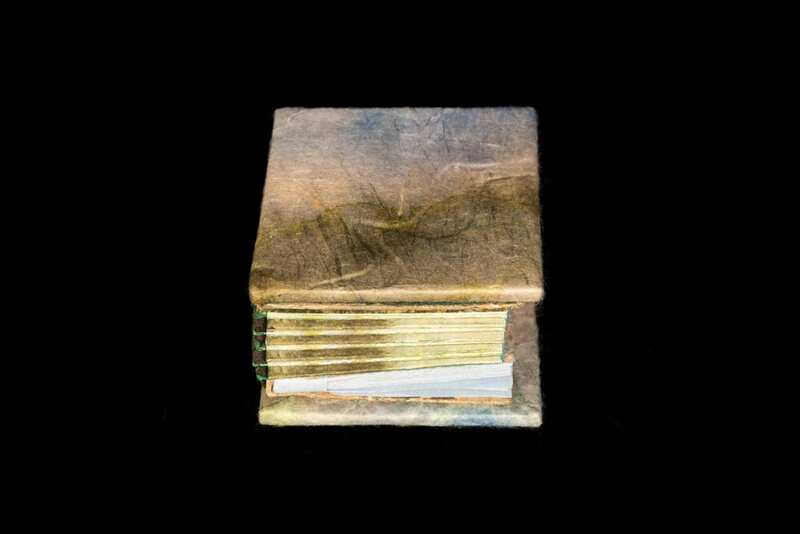 This moveable book is constructed in three sections: the poem, in a perfect-bound matchbook style, the bio/stamp in a trifold within its own covers, and the central accordion tunnel comprised of vintage postcard images of the Glynn marshes. 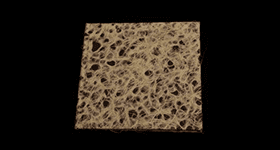 A band of natural straw slips off to open the volume. Digitally printed in 8 pt Poor Richard on pale blue ribbed vellum paper in brown, green, and blue inks. All interior cover papers are layered unryu. 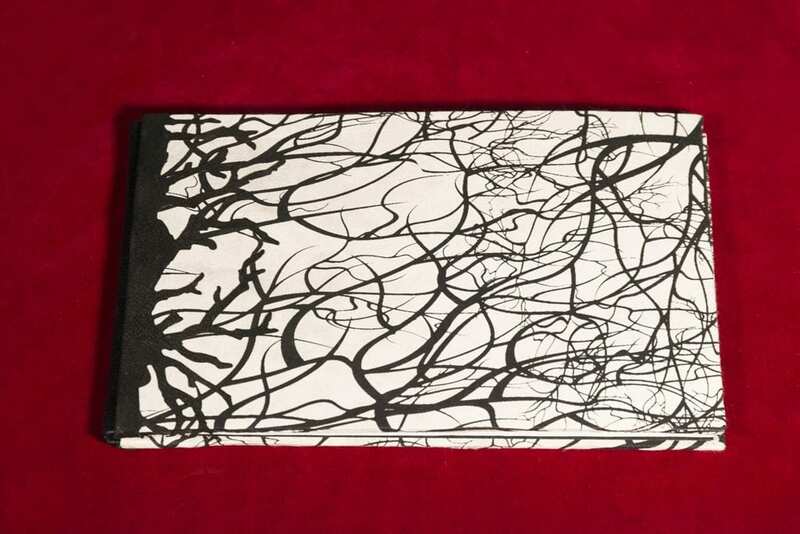 The outer paper covers were painted with ink and watercolor by the binder/ publisher and each is unique. 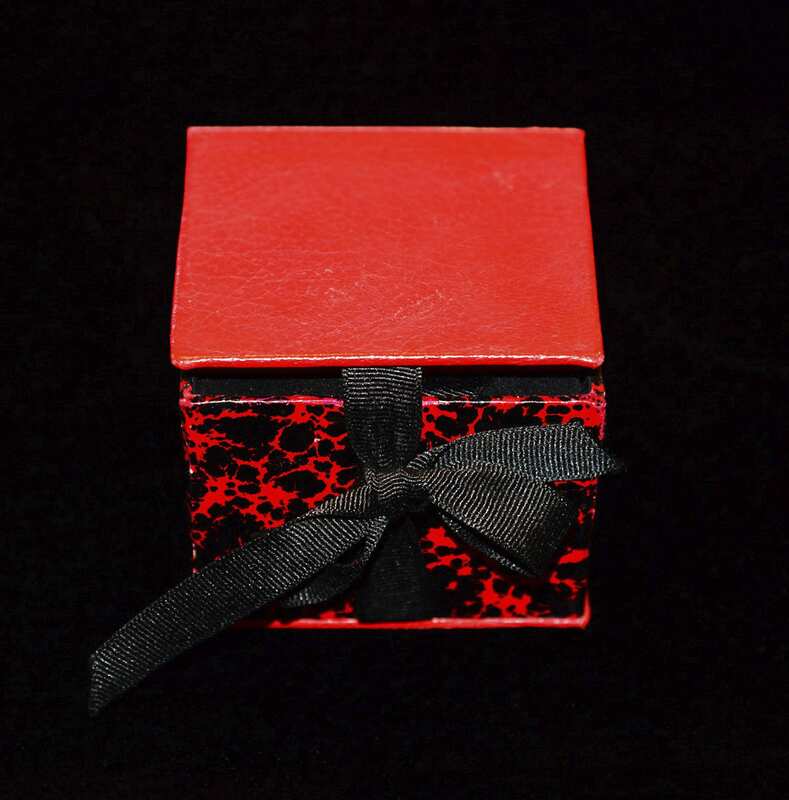 Dimensions: 2 3/4" x 3", closed. 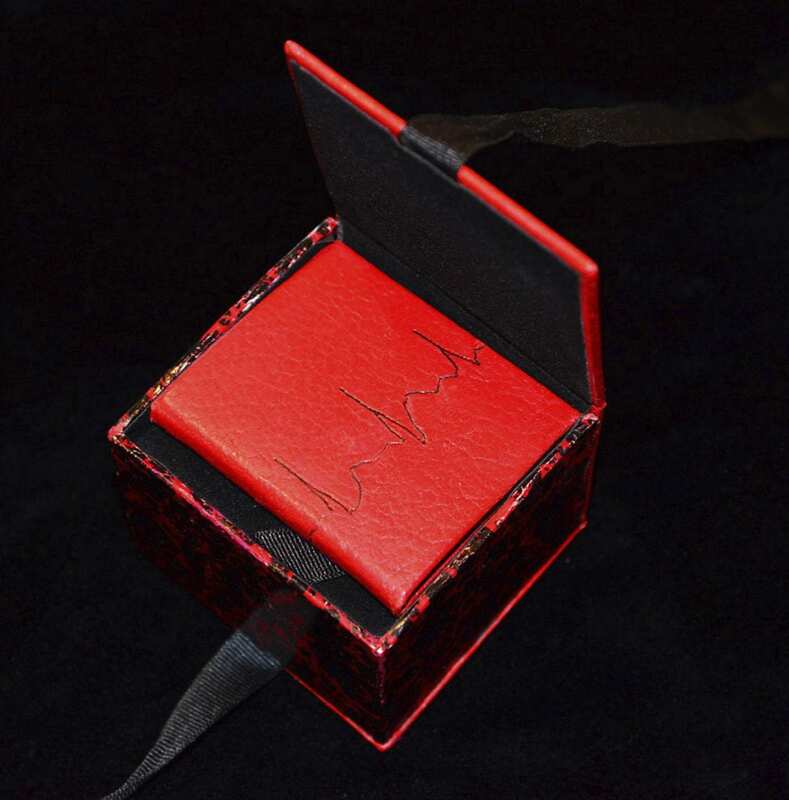 An edition of ten, with two out-of-series, has been created. 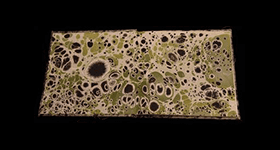 A one-of- kind piece, Elemental is comprised of an explosion box covered in a large scale marbled paper from India. 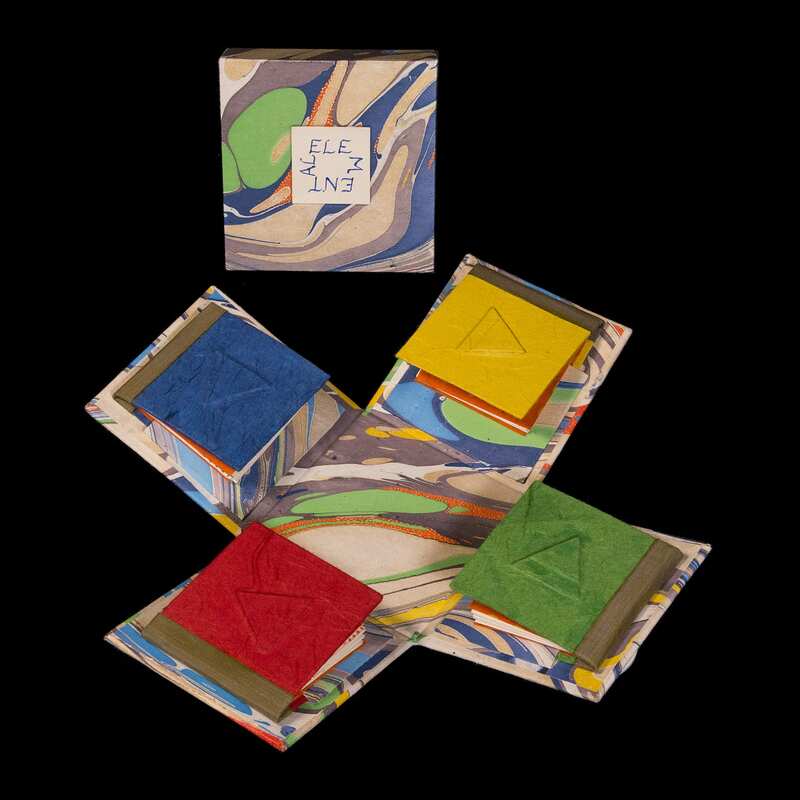 Its bright colors are echoed in the covers of the four removable miniature books within, each featuring hand-lettered quotations associated with its respective classical element: fire, water, earth, or air. 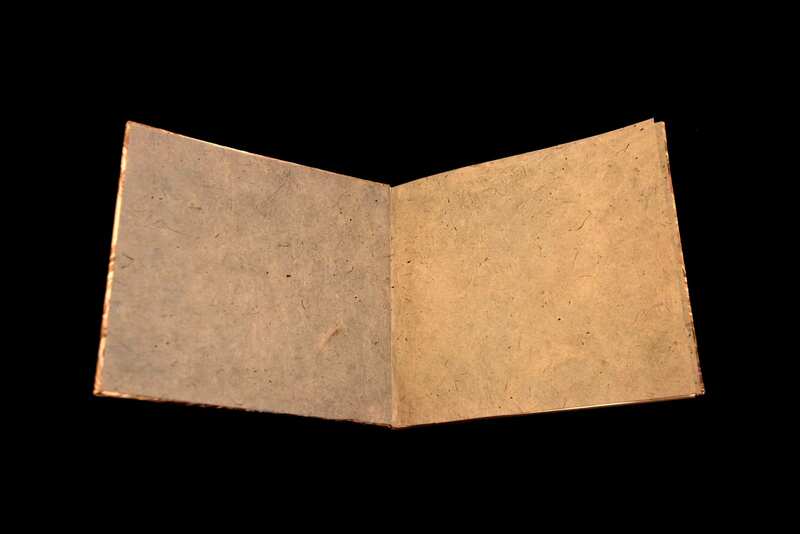 Underlays are used to convey the respective elemental symbol for each paper-covered book. The taupe-colored bookcloth spines have been marked with gold ink to reflect the gold of the marbled box exterior. Interior text calligraphy is also multi-colored. 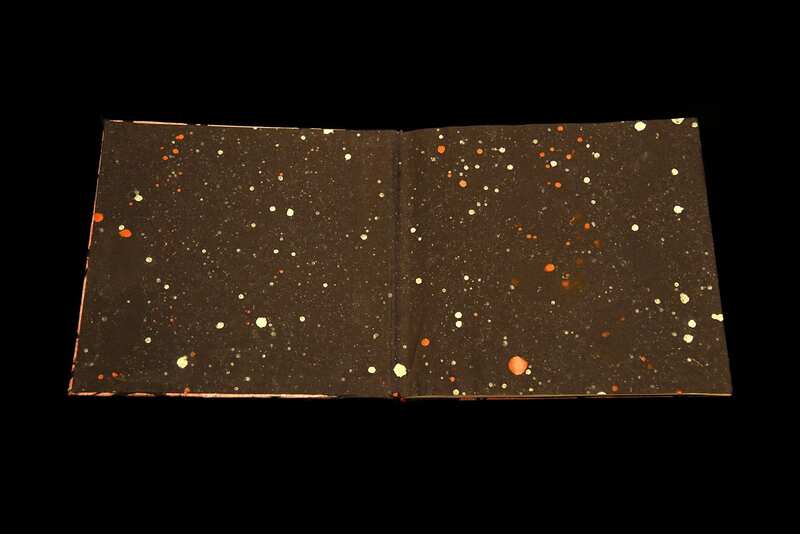 A wax-resist painted paper of orange with yellow dots appears as endsheets for all four miniature books and the box lid lining. Fascinated with the works of Edward Gorey since high school, my binding efforts led me to embark on the challenge of rebinding (or binding) all 100+ titles authored by him, with the occasional distraction of books featuring his illustrations only. 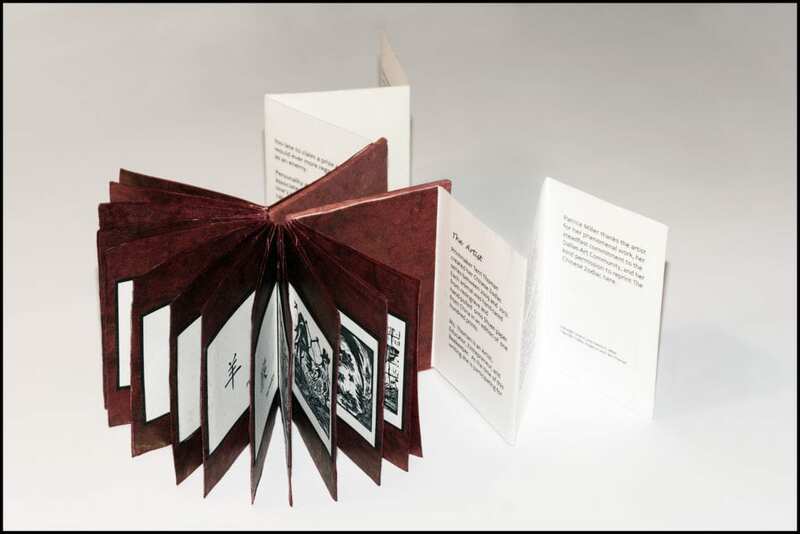 The “Edward Gorey Binding Project,” I expect, will take me another five years to complete. 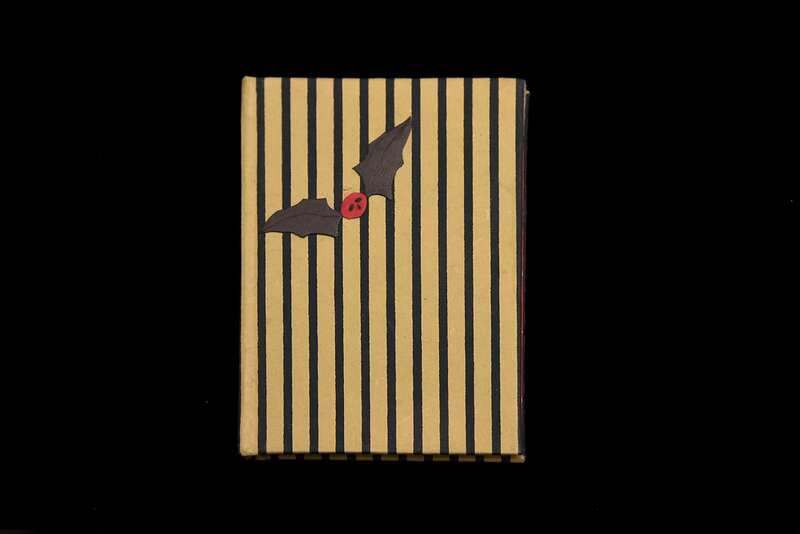 The books are currently located within a rotating display at the Edward Gorey House, and as such, are not for sale. 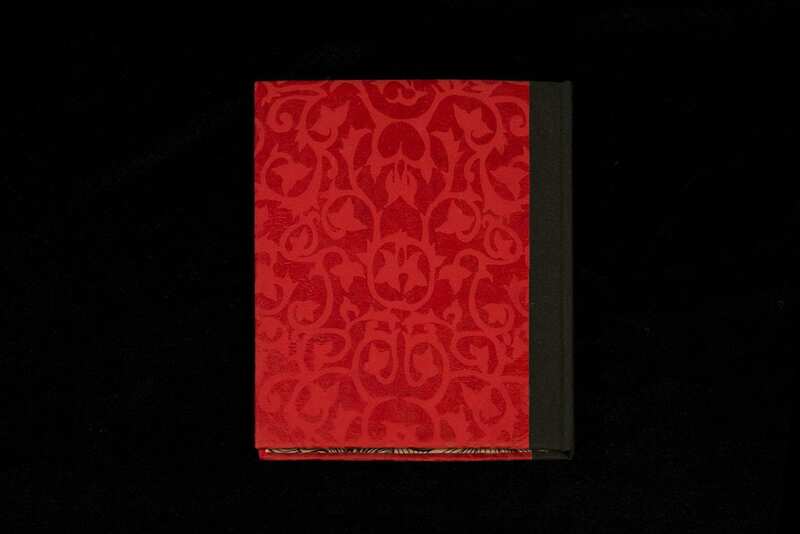 Please see "Rebindings for Sale" for information about my small editions of Gorey rebindings for sale. Editions rebound are stated in individual title descriptions. 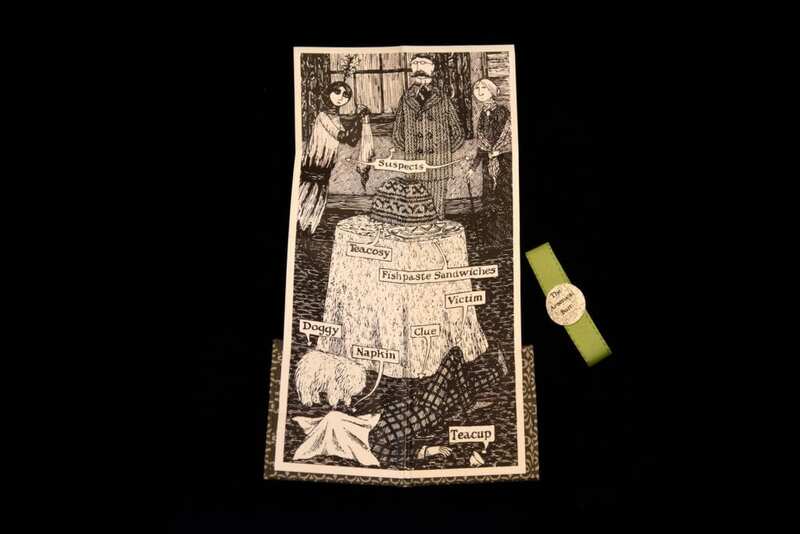 This flag book features the Gorey text and illustrations cut from an Edward Gorey House poster. 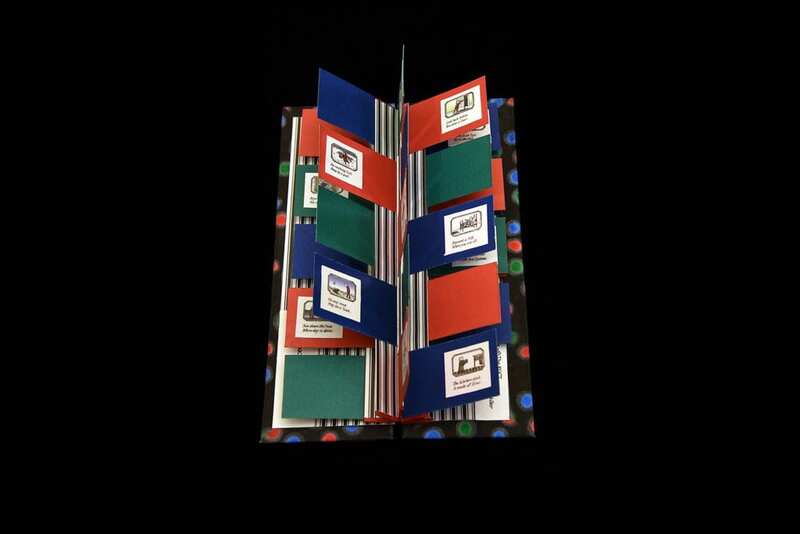 The text was mounted to red, blue, or green textured cardstock, which, in turn, was affixed to a red lotka-backed accordion. 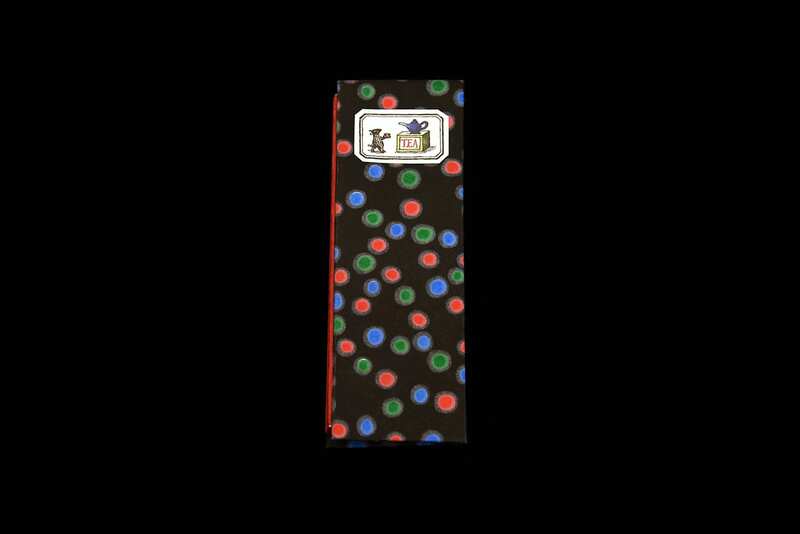 Black background yuzen paper with dots of bright blue, red, and green covered the boards. 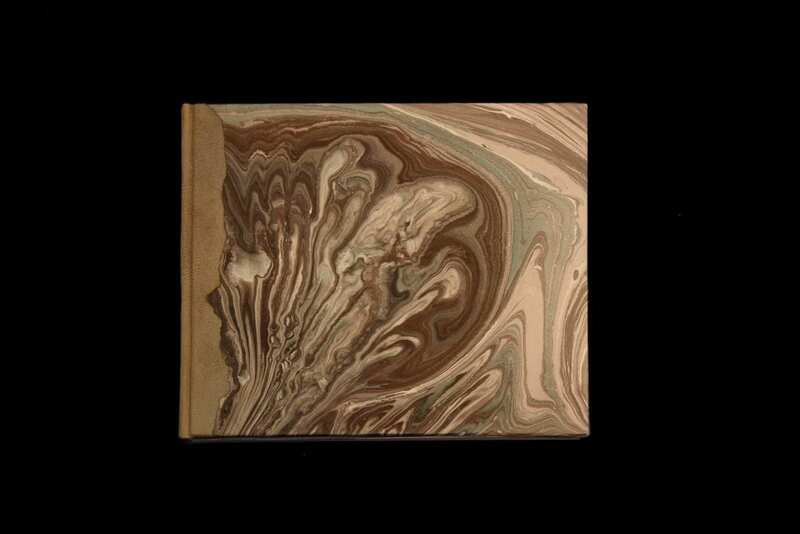 After this book was created, an edition of three (nfs) was made in a smaller version, using predominately the same materials. 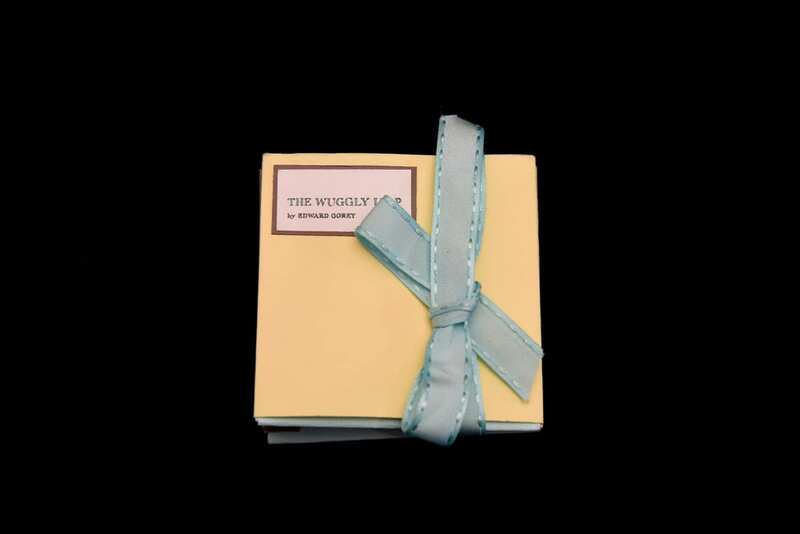 Pastel cardstocks that recreated the original book’s palette were chosen for this accordion/stub binding with paper wrapped, non-adhered covers and a pale aqua ribbon tie closure. 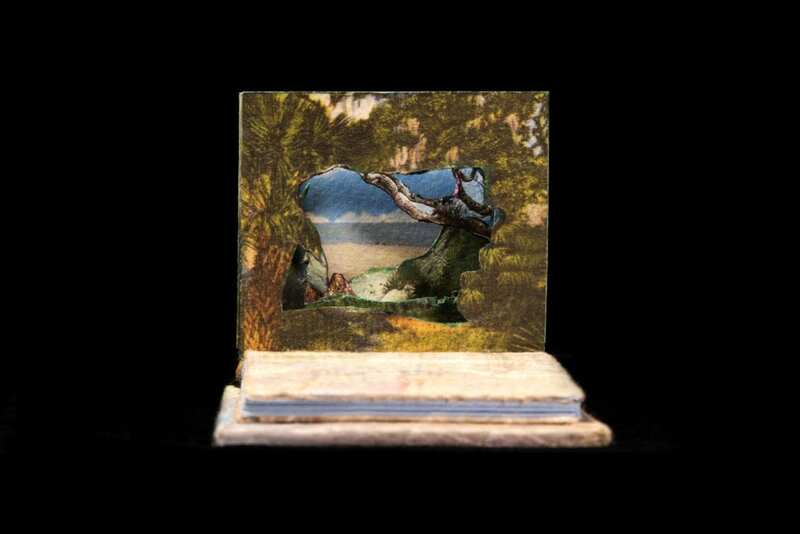 The edition of three copies (nfs) includes a pop-up depicting the children’s fate at the end of the story. 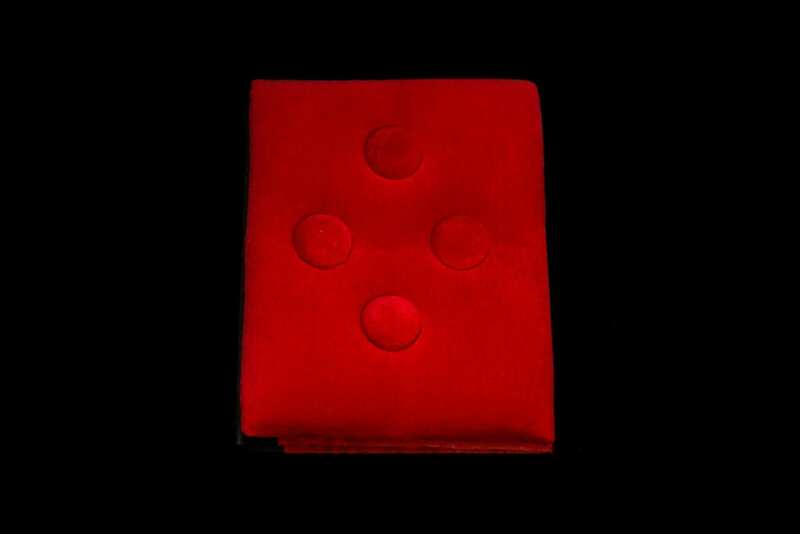 Sumptuous in tufted red cotton velvet with covered buttons. 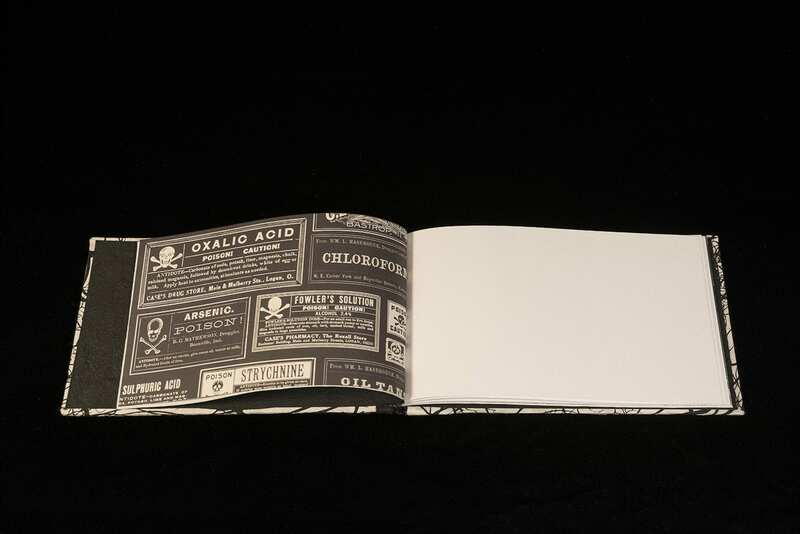 The title appears on a silver foil-stamped spine of black Italian book cloth. 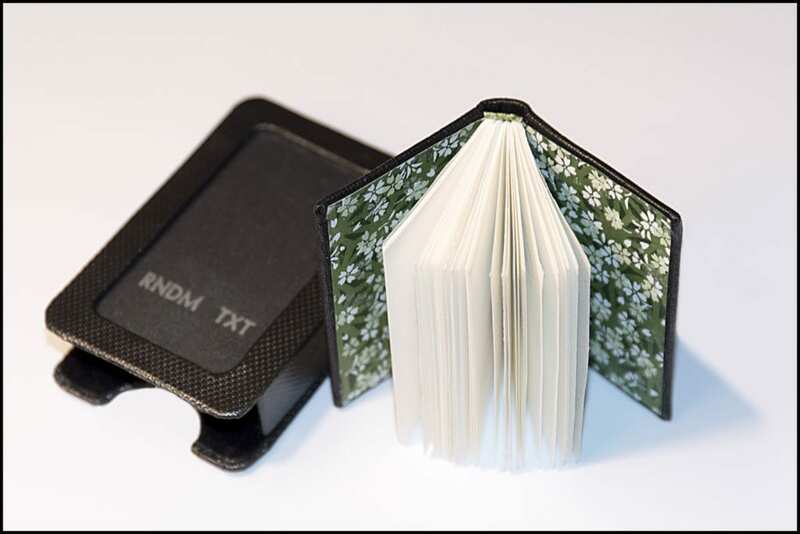 A near miniature version of the rebinding (not pictured) was made as an edition of four (nfs). Red velvet paper was substituted for the covers; the other materials are the same. 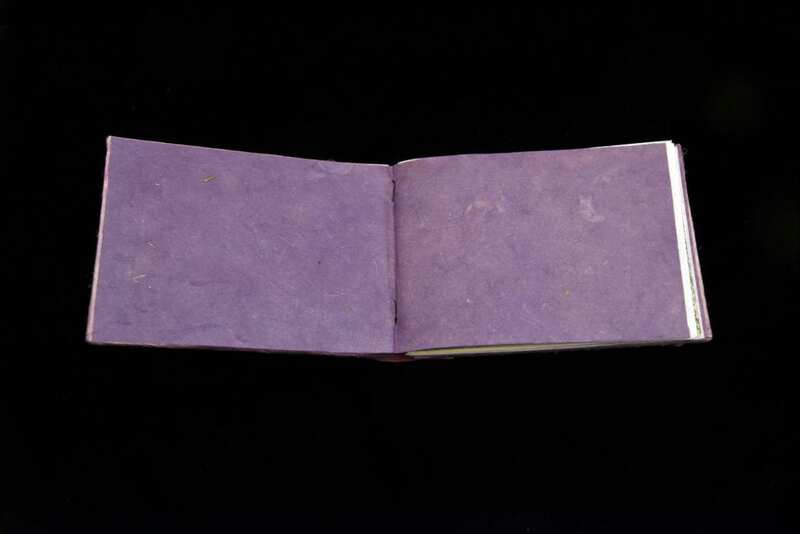 In honor of Gorey’s dedicatee, Violet ‘Bunny’ Lang, the flat-back binding's front and back covers are a predominately purple yuzen floral, with a foil-stamped title on the goatskin spine. 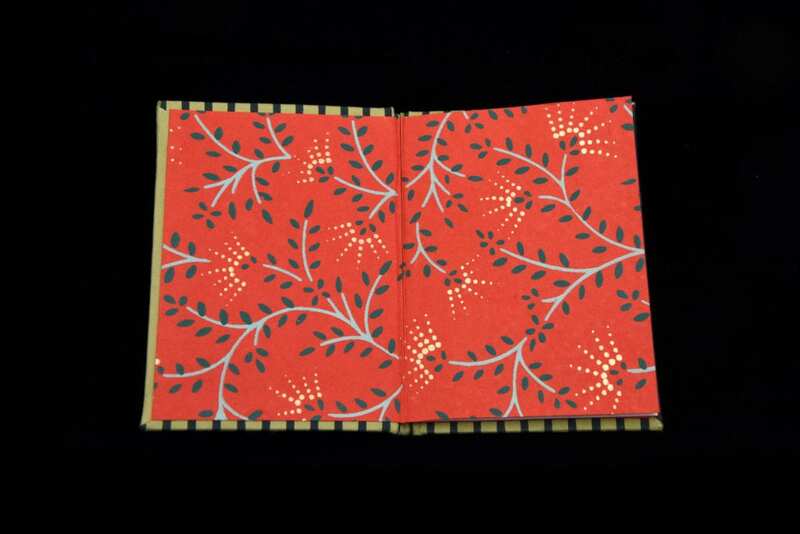 Endpapers are a screen-printed Indian cotton paper featuring a modern, post-war-reminiscent motif, a nod to the era of their friendship. 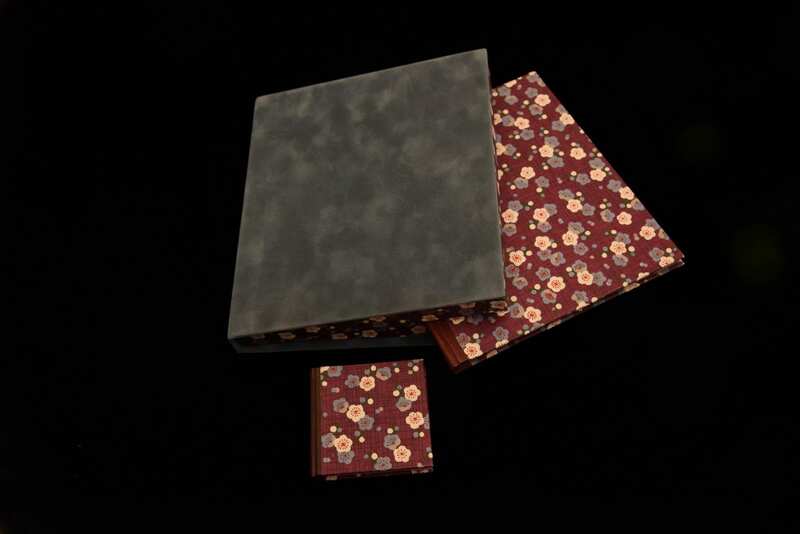 The book’s enclosure is a clamshell box of blue faux suede, the same floral, and an interior lining of lavender mulberry paper. 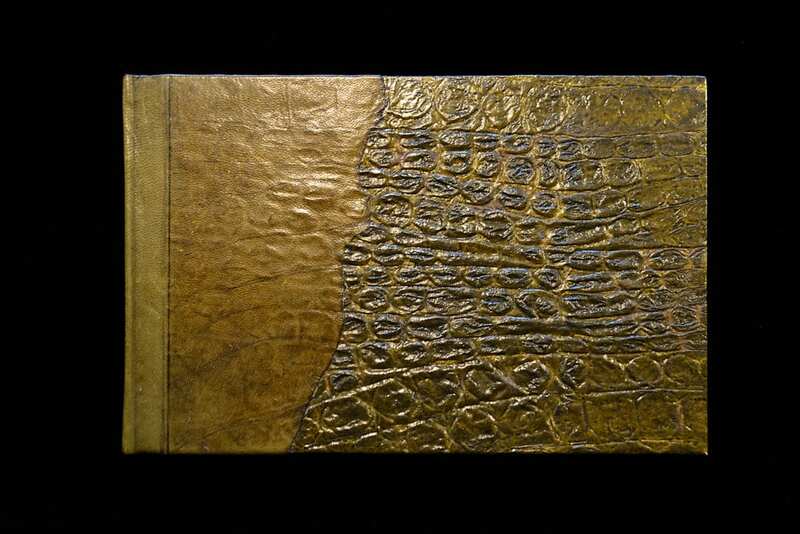 The styling of this rebinding was replicated at less than three inches square; three copies (nfs) were made using the same material palette. 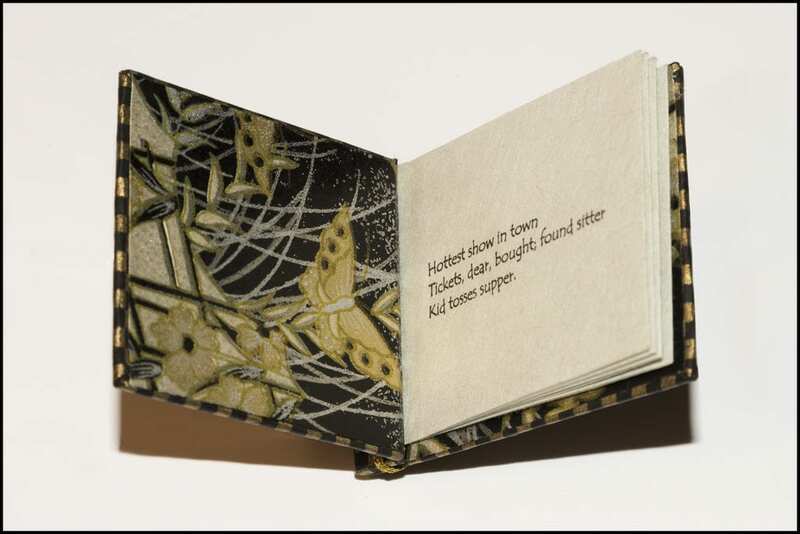 Never before printed as a stand-alone work, this edition of four (nfs) includes the title, text, and colophon in a six-paneled page, with Gorey’s illustration on the opposite side. The folded piece is kept closed with a green ribbon band. 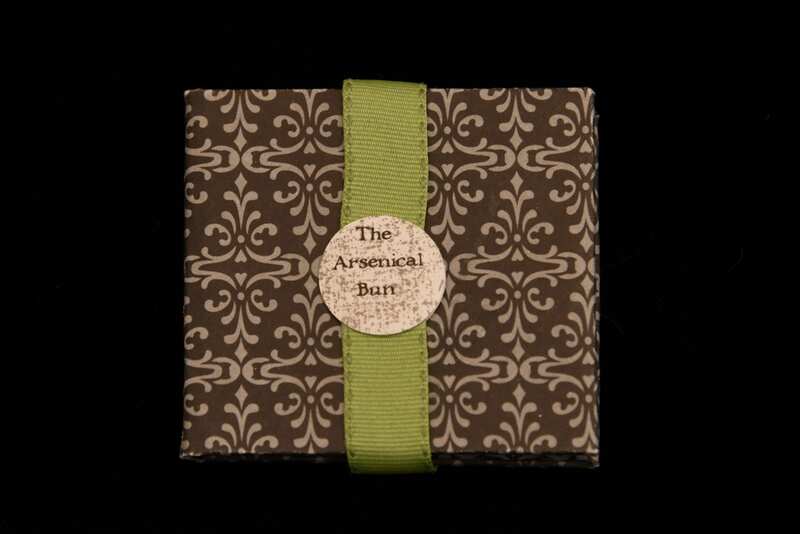 The title is affixed to a paper ‘bun’ on the ribbon. Green Thai alligator patterned textured paper and moss green goat skin, distressed and painted, comprise the back and front covers. 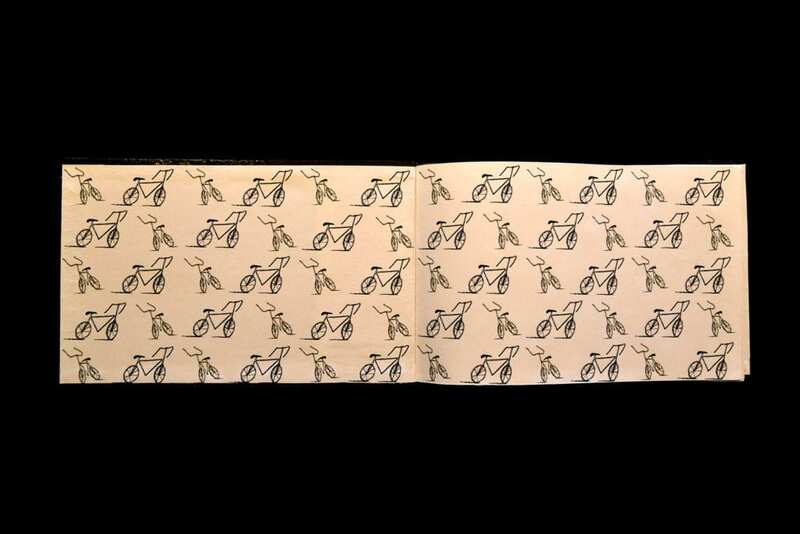 Endpapers were designed by the binder and printed on Cougar text. Millicent Frawley’s sacrifice is memorialized in black lokta overlaid with pale green web-like ogura lace paper on the exterior. The interior features a beautifully creepy marbled paper by Catherine Levine. 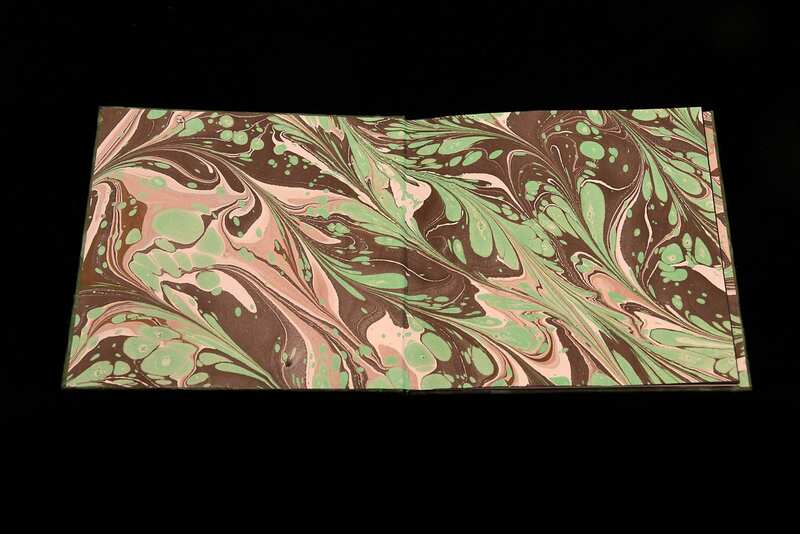 Clover sun-washed print is featured on the exterior of this rebinding, while the interior employs a green and grey swirl patterned marble paper by Catherine Levine. 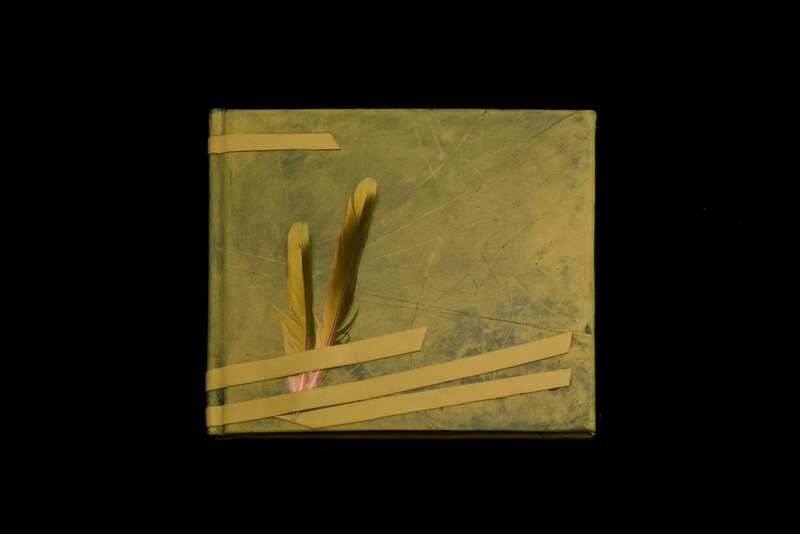 Covered in a bright yellow-green calfskin, the leather was sanded, distressed, and dyed with blue inks and features blue and green feathers from the binder’s Quaker parrot, Django. 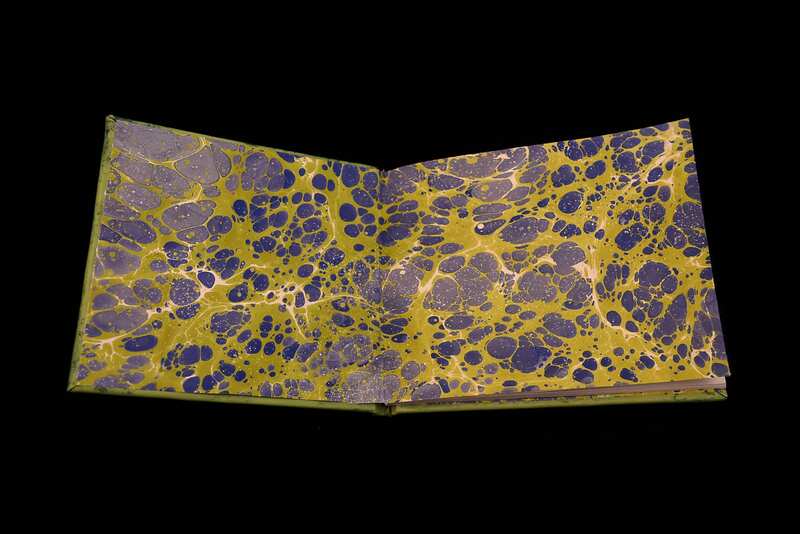 A green and blue hand-marbled paper by Catherine Levine is used for the endsheets. 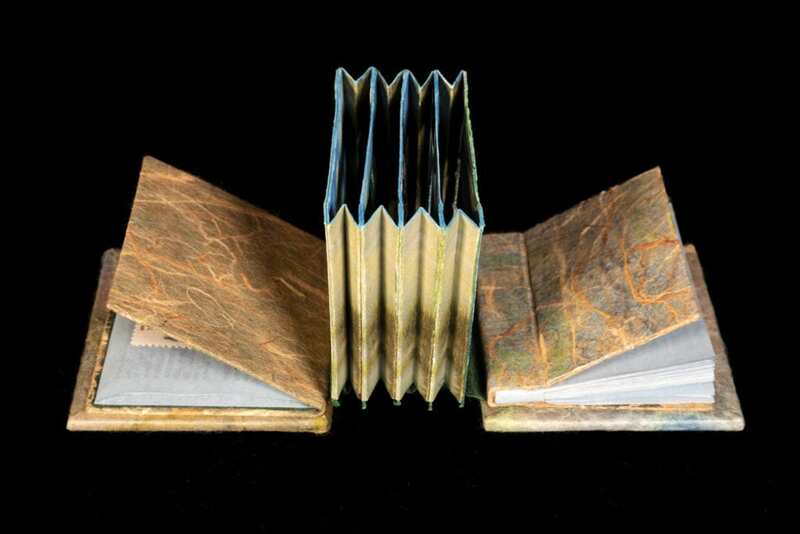 For this binding, a “hand” pattern of blues and tans, visible in a marbled paper by Catherine Levine, evokes the title. 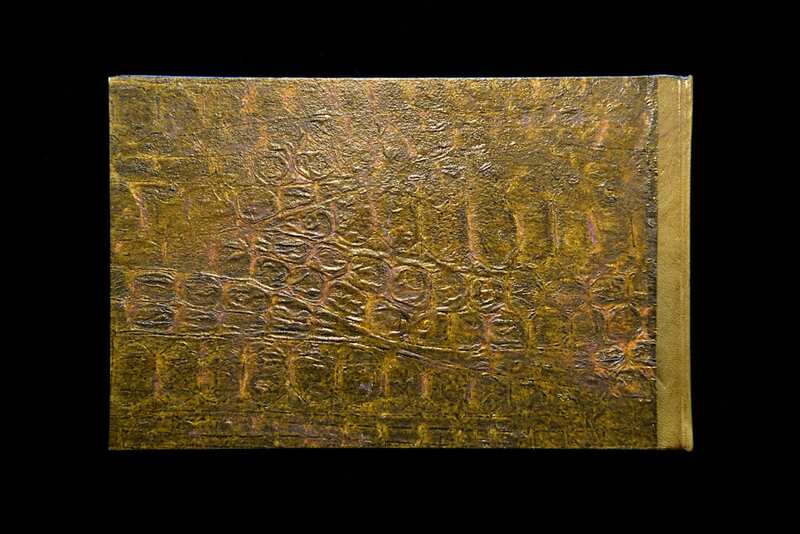 Painted and distressed goatskin is used at the spine area. Endsheets are a heavy, watery blue lotka. Although not on the “A” list, the book, authored by John Updike and illustrated by Gorey, proved irresistible for a new binding treatment. 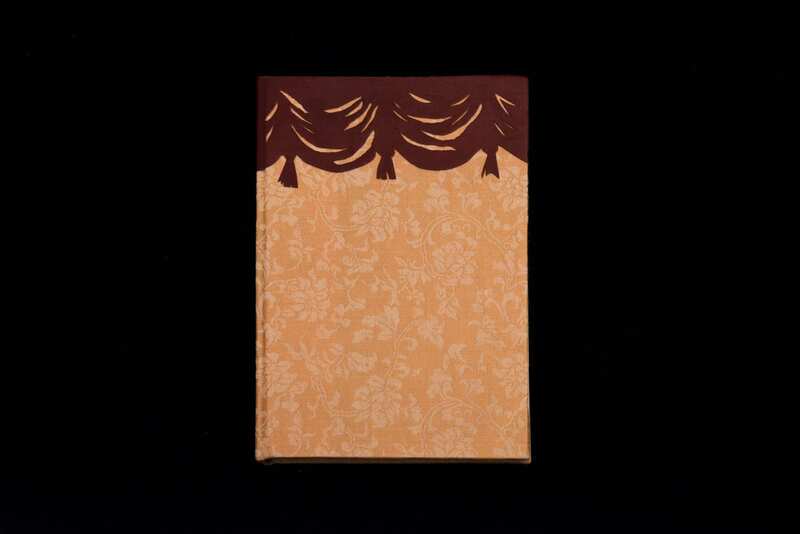 Silk-screened Indian cotton rag papers were used for the cover and endsheets. 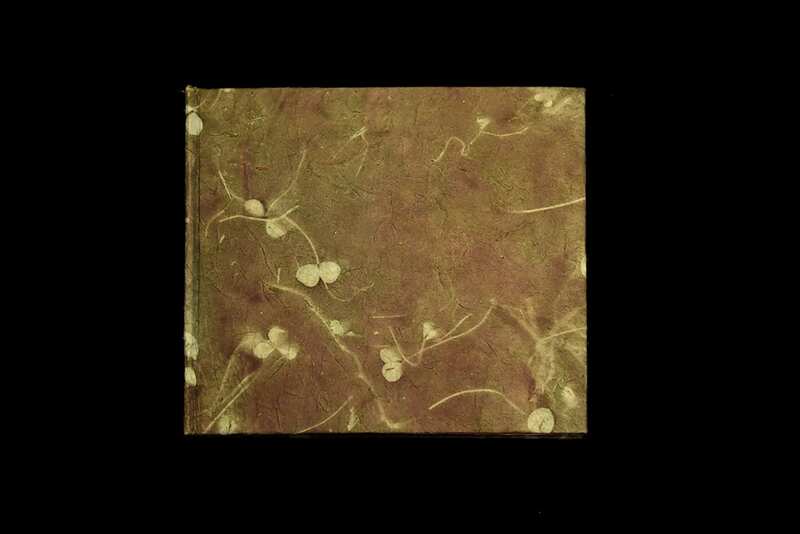 The cover features red and green goatskin overlays depicting a Gorey holly sprig. 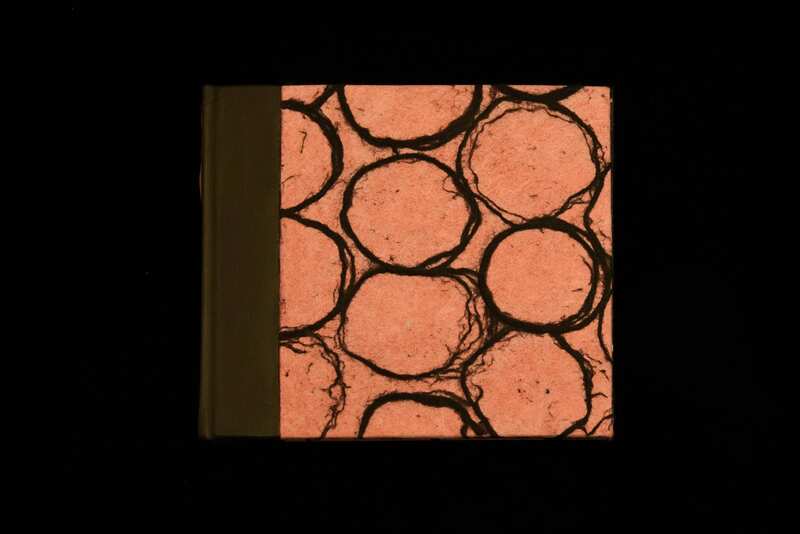 Sheer paper imbedded with irregular black yarn circles overlays almost metallic reddish-pink covers. 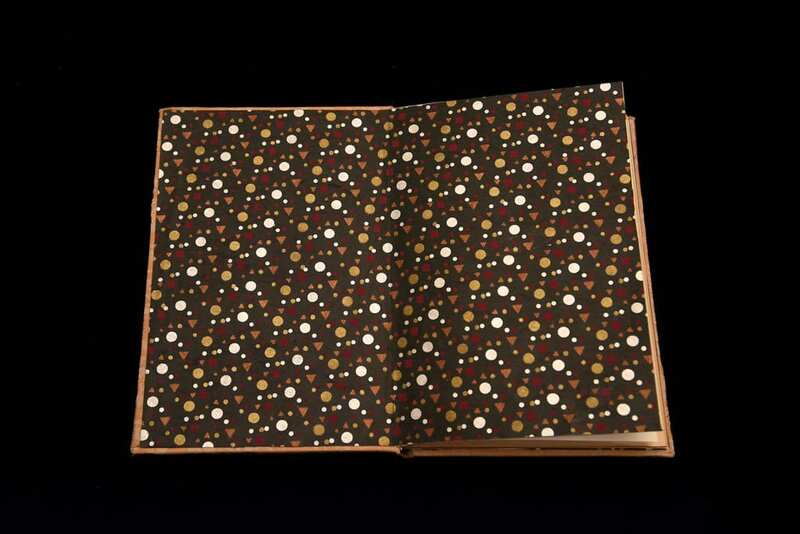 A mottlled paint-spattered background paper is employed for the endsheets. Gorey's first book gets an unexpected treatment, with vintage gold brocade bookcloth covers topped with an overlay of burgundy goat, hand cut to resemble the concert hall drapery of the original cover image. With matching burgundy leather hinges, the interior features endsheets of charcoal grey rag paper printed with gold, silver and burgundy geometric shapes - a very 50s look to salute the 1953 publication of the original. 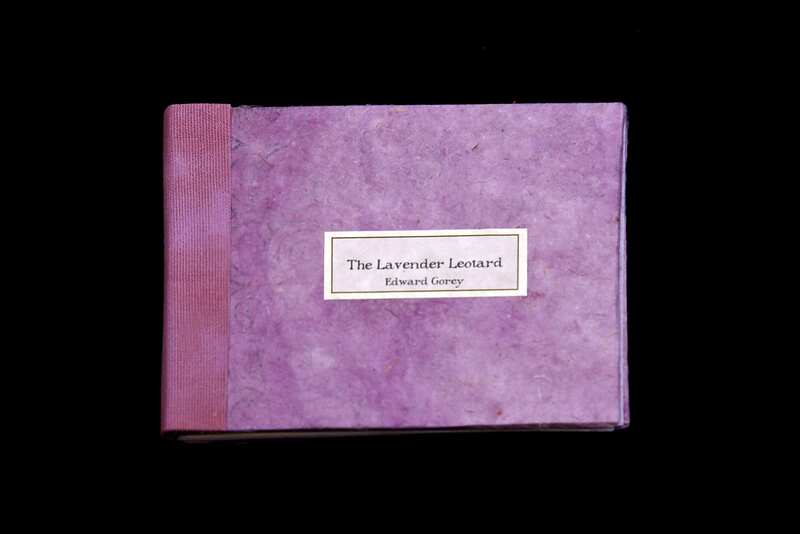 With the Gotham Book Mart softcover's staples removed, The Lavender Leotard's text block was left in tact by sewing with linen thread and creating a new sewn board binding. 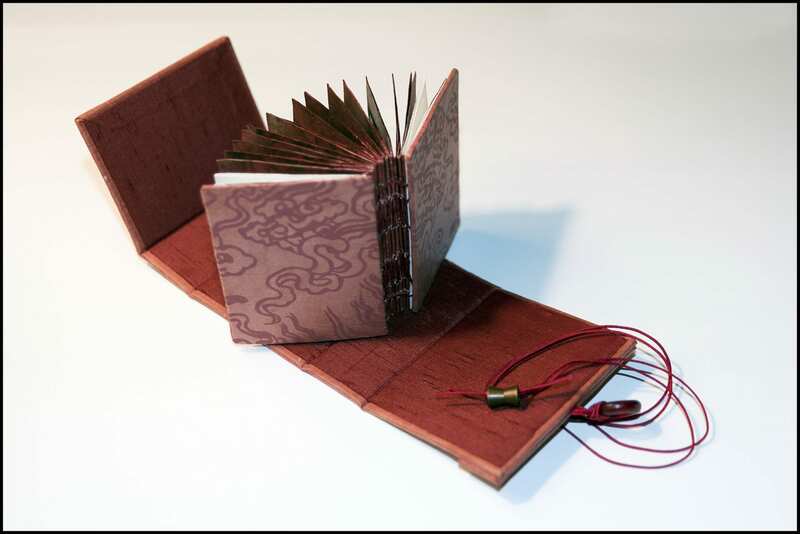 Now encased in hardcovers, the book features a painted book cloth spine and purple lotka over boards. For prices and availability of the bindings listed below, please email Kim Herrick at The Book Lair: books@thebooklair.com. 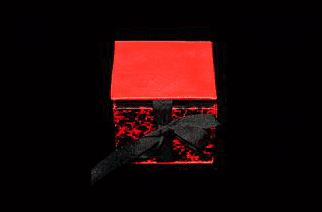 To find current listings, search for 'Patrice Miller' at the Book Lair site, www.thebooklair.com. Rebindings of the first printing of the 1980 Dodd, Mead first hardback edition of Gorey’s 1963 book. 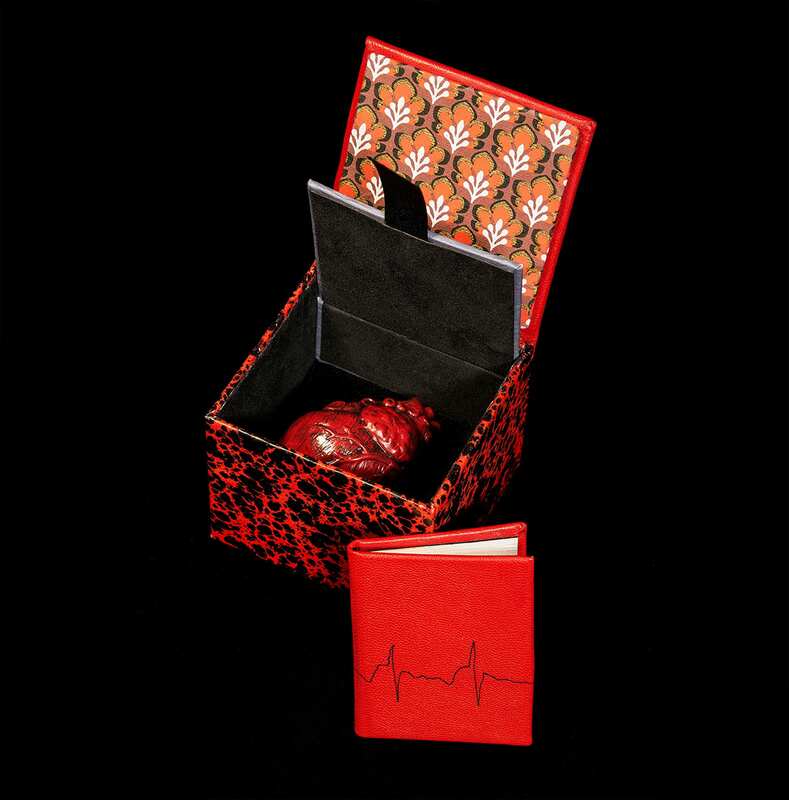 The front cover is of a sumptuous red cotton velvet with covered buttons, while the back cover is of a red ivy patterned lokta, Endsheets are a black and white silkscreen-printed lotka, or an Indian cotton red, gold, and black paper. An edition of five was created. 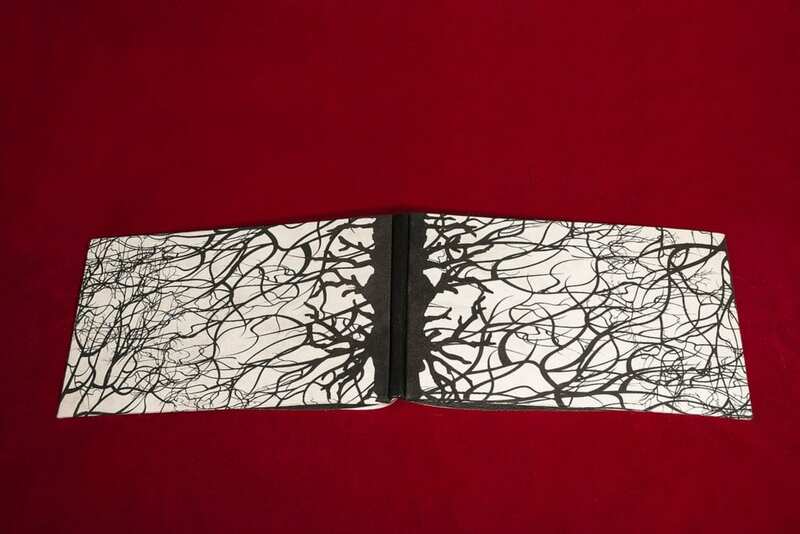 Rebindings of the first printing of the Harcourt edition, the work has been recast in a Braedel binding with black goatskin at the spine and with black suede ‘branches’ on covers adjacent to the spine, Nepalese silkscreen paper covers, and poison label endsheets. An edition of five was completed. Modifying the design of my original rebinding, this treatment features the 2007 Ballet Review edition. The original covers are left intact, with only the softcover's staples removed. An enhanced sewn board binding is employed, and the new boards are covered in a dark blue printed pattern on purple lokta.